This propagandistic poster displays key aspects of Nazi antisemitism and racial ideology, which asserted the supremacy of the “Aryan race” and the need to purify Germany of Jews. Plagued by political unrest and economic depression in the post-World War I era, Germany was fertile ground for the rise of extreme right-wing nationalist organizations. Among them was the National Socialist German Workers' Party (NSDAP), commonly known as the Nazi Party. Many Germans placed their hopes for national revival in the Nazis and their leader, Adolf Hitler, who was elected to the chancellery in 1933. At the core of Nazism was a racial ideology which asserted the supremacy of the “Aryan race” over all others. Antisemitism played a central role in this ideology, with Jews seen as the embodiment of absolute evil, and their defeat necessary for the racial purification and national salvation of the German people. This propagandistic poster, published during the Nazi era, contrasts Jews with “true” Germans. 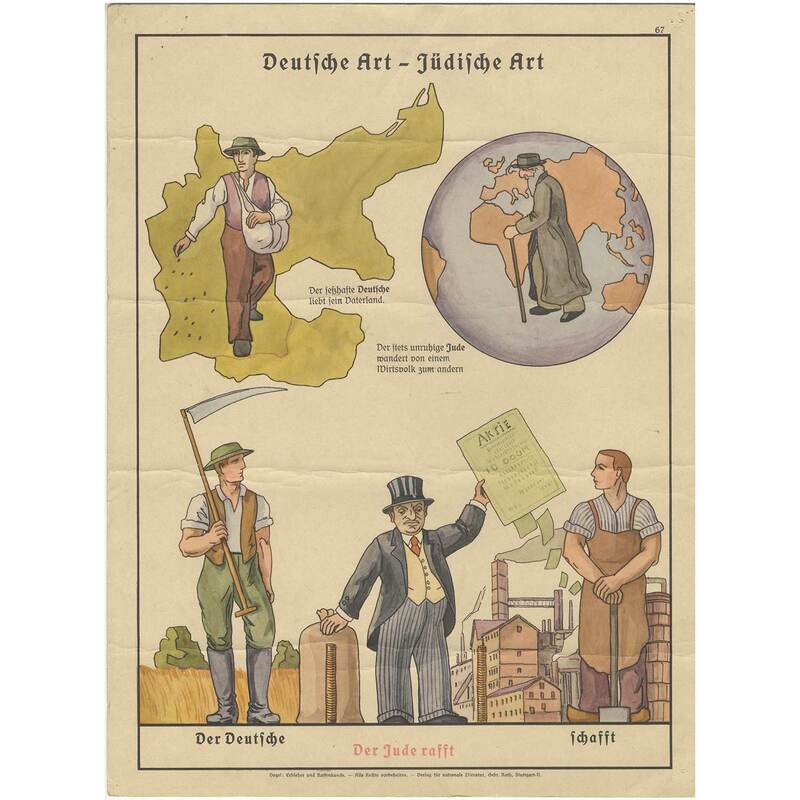 Here, the German is pictured as farmer and industrial worker, who is “settled” and “loves his fatherland,” while the Jew is shown as “always restless,” wandering from one host land to another. Liebmann describes harassment and anti-Jewish sentiment in Germany during the 1930s. Filmed 1990. Dimensions: 15 3/16 x 11 7/16 in. Holocaust Encyclopedia, United States Holocaust Memorial Museum.